Over 95,000 BeerSmith brewers use the BeerSmith cloud to store their recipes and move them between their desktops, laptops, phones and tablets. But did you know you can also easily share them with friends and fellow brewers in the community? You can even rate and comment on other people’s recipes to help build the community. Highly rated recipes can be found by fellow brewers and imported directly into BeerSmith. You can follow other brewers or accounts and be notified when others post new brews. Many brewing clubs, for instance, have BeerSmithRecipes.com accounts so they can post popular recipes for their members. At the technical level, the cloud is really a large dedicated web server that stores and indexes recipes. When you copy a recipe to your Cloud folder either from your desktop or mobile device, that recipe gets put on the server so you can access it from your other devices. By default a recipe is always added as private – since most brewers don’t want their “work in progress” shared with the world. However you can choose to mark any recipe as “shared” so other brewers can find it, review it or download a copy for their personal use. To share a recipe on the desktop all you need to do is go to your Cloud folder, select the recipe and then pick the large “Shared/Private” icon on the ribbon (it looks like a big lock). It will toggle your recipe between shared/private. Shared recipes will be marked as “shared” in the privacy column in Cloud view. Similarly you can go to the cloud folder on your mobile device, open a recipe for viewing and mark it shared or private using the “Mark Recipe Shared” or “Mark Recipe Private” button just below the block containing the recipe name. Marking it shared will make it public. A lot of people are not aware that in addition to the mobile and desktop apps, you can view your recipes from the web. Go to BeerSmithRecipes.com and log into your account there. You can view or delete your own cloud recipes there and you can also find new recipes and make private copies of them (which go to your Cloud folder) for future use. If you are logged in, you can also use the site to rate other people’s recipes. So if you’ve found a great recipe, go ahead and leave a comment for the author of the recipe. Ratings really help other people “sort through the weeds” to find the best recipes to brew. Another cool feature is the ability to follow another account. You can click on the user name for a recipe you’ve found and look at other recipes they have shared or follow them. By following them you will get notifications when they post a new recipe. As I mentioned above this is a great feature for clubs, as members can follow a club account and get notified when new recipes are posted to the account. Basic, free accounts on BeerSmithRecipes.com have a limit of 15 recipes, in part to manage the load on the server. You can upgrade your account to get additional space as well as features by going to the upgrade page at BeerSmithRecipes.com or by purchasing a Gold or Platinum bundle with BeerSmith desktop. As I mentioned many commercial shops and clubs have upgraded accounts set up to share their shop or club recipes. 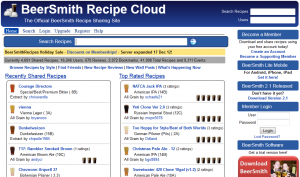 So those are some basic features for sharing and rating recipes on the BeerSmith Cloud. Thanks for joining me on the BeerSmith Home Brewing Blog. Be sure to sign up for my newsletter or my podcast (also on itunes…and youtube…and streaming radio station) for more great tips on homebrewing. Also check out the How to Brew Video series I shot with John Palmer if you want to learn more about all grain brewing. Hi, I’m using Beer Smith, but since couple of days/months the search on cloud is not working anymore. Is it a bug or something know? Can you help me with that? Do I need a gold or higher membership to be able to use the mobile app and sync? Do I need the gold or higher membership to be able to use the mobile app and sync?